Art lovers will have no trouble getting around Art Basel week traffic in Miami next week. 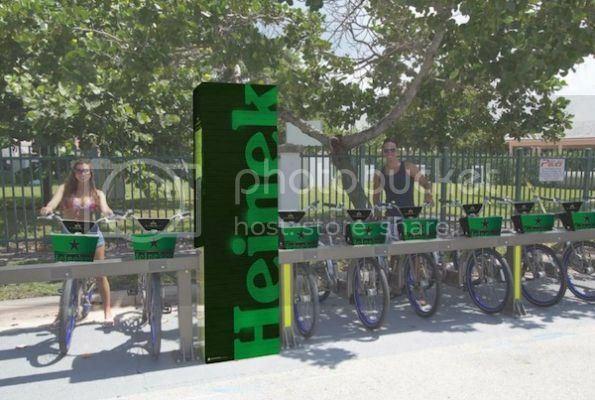 Heineken has teamed with Wynwood Art District's bike sharing program, "Deco Bike," to provide green Heineken-branded bikes with built-in QR code technology. The Deco Bikes are equipped with QR (quick-response) codes both on the bike station map and murals throughout the city, which will provide inside-info to bicyclists regarding the murals, artists and other special events. In addition to the art instillations that Deco Bikes will guide visitors to, Heineken will also host secret mural site pop-up parties pairing art with world-renowned DJs, for what it's calling a true audiovisual experience. The spontaneous pop-up parties will be announced on Twitter by following #heinekenmurals. To learn more about the Heineken Mural Project watch this video and if you like what Heineken's doing to bring art fans closer to the action, also check out how Heineken uses QR codes to connect music fans.